In 2008, Romania completed its EU accession. Since then, there have been a number of events in Romanian high-level politics, that centered debates on ritual magic – including presidential candidates accusing each other of winning the elections through the use of the occult (2009, 2010) and various law projects intended to formalize and tax ritual magic (2011). My analysis focuses on the ways in which male urban elites in Romania, an EU member state, negotiate their seemingly conflicting identities as administrators of a secular form of government on the one side, and clients of practitioners of magic, on the other side. What are the roles discursively assigned to the occult and the secular and how can we deconstruct them to make sense of why people choose or dismiss religious identities and practices? My work analyzes ideological West-East divides by looking at the scholarship produced by anthropology on areas largely accepted as ‘Eastern European’, ‘socialist’ and ‘post-socialist.’ From a critical point of view, we can say that area studies are working towards reifying ideological boundaries within the European subcontinent. 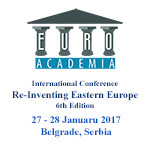 Much like African, Latin American, or East Asian studies, the study of Eastern Europe perpetuates stereotypical ideas about cultural difference; these include stereotypes about the nature of people in the area, their moral values and work ethics, their capacity for producing capital and a modern society, racial and gender identities, and the like. This approach is fed by an evolutionist impulse in the anthropological discipline and international organizations (often neoliberal) that expects constant modernization from the ‘developing world’ (hence the name). However, this preached modernization never reaches an endpoint – when Eastern European countries finally attain certain imposed standards, Western Europe and North America will already have developed, and have reached new standards, so there is always an impossible amount of catching-up to do. The EU is a politico-economic project that I see as essential to perpetuating this mindset.